TUGboat, Volume 35 (2014), No. 3. 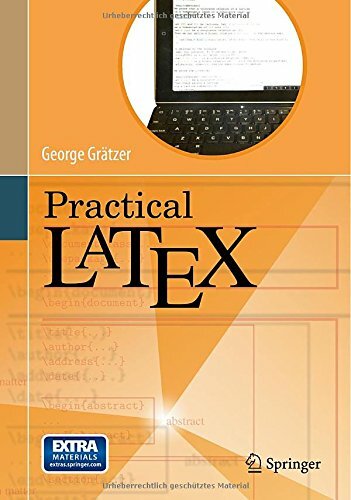 George Grätzer, Practical LaTeX, http://www.springer.com/new+%26+forthcoming+titles+(default)/book/978-3-319-06424-6. Paperback, 216 pp., Springer, 2014. For those interested, Grätzer is also the author of Math Into LaTeX, More Math Into LaTeX, several other LaTeX books, and many non-LaTeX books also. Practical LaTeX is a slim, well-named volume, since it is eminently practical. It is an excellent introductory text, covering contemporary markup, macros and packages, eschewing obsolete material. Covering the essentials of document production including niceties such as BibTeX and TikZ, it is an excellent, up-to-date introduction which one can hand to any potential user with confidence that it will help them to rapidly achieve a basic proficiency allowing for the production of documents with an efficiency which would be the envy of other tools. Nicely designed and typeset, it covers document elements including text, environments, formulas, illustrations, symbols and bibliographies as well as presentations and the customization of LaTeX. The coverage of illustrations is especially nice, including both the basics of placing image files using the graphicx package and creating illustrations using the code-oriented tool TikZ (this chapter is based on Jacques Crémer’s publicly available A very minimal introduction to TikZ). There is an excellent index as well as several very useful appendices for symbols and commands which also make the book a useful quick reference. If the book has a flaw, it is the rather inexplicable appendix “LaTeX on the iPad” which unnecessarily limits itself to a specific platform and swerves into a political screed which at once complains that the GNU Public License (GPL) “stops you from having it used on the fastest growing platform of all time” while at the same time discussing several different LaTeX apps for the iPad which are capable of typesetting LaTeX documents. As an historical footnote and commentary: Duncan P. Steele of Valletta Ventures had initially authored a blog post complaining of the LaTeX codebase and noting that the GPL licensing of the mainstream TeX distributionsmade producing a TeX editor for the iPad impossible due to the interactions of Apple’s licensing and the GPL, http://vallettaventures.com/2011/12/10/messy-latex/. However, after being informed of the existence of KerTeX (http://www.kergis.com/en/kertex.html), which is available under a permissive license, and being convinced that TeX itself was available in the public domain, Steele was able to produce a version of TeXpad which runs on the iPad: http://vallettaventures.com/2012/09/07/texpad-ipad-v1.1/. Highly recommended for beginners, in particular those who might wish to make use of LaTeX on their iPad, as well as the occasional user who needs a reference. An updated version which eschewed the political commentary and included coverage of at least one of the many LaTeX editors for Android tablets would be especially welcome.